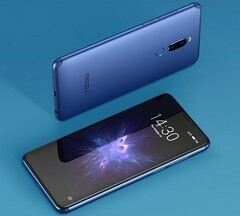 Also known as the M8 Note, the Meizu Note 8 is a 6-inch Qualcomm Snapdragon 632-driven Android handset that comes in blue, red, purple, and black. This handset sports a rather common 12 + 5 MP dual camera setup on the back, and will go on sale in China next week for the equivalent of about US$185 (4/64 GB configuration). As if last month's Meizu 16X, V8, and X8 were not good enough, the Chinese brand has just introduced a new mid-range device that sports good specs and carries a sub-US$200 price tag. The Meizu Note 8 is by no means a Samsung Galaxy Note 8 clone and is also known as the M8 Note, so be sure to keep that in mind — it might be useful when you go shopping online for a good mid-ranger and you have to decide between two Meizu devices that seem to be different at first sight. The specs of the Meizu Note 8 include the octa-core Qualcomm Snapdragon 632 processor (some sources erroneously reported it to be the non-existent Qualcomm Snapdragon 638), 4 GB of memory, 64 GB internal storage space and microSD support, a 6-inch notchless display with 2,160 x 1,080 pixels, a 12 + 5 MP dual camera setup on the back, an 8 MP selfie shooter, all powered by a 3,600 mAh battery with mCharge (Meizu's fast charge technology with a peak power of 18 W). The Meizu Note 8 runs Flyme OS 7 on top of Android 8.1 Oreo and can be already pre-ordered for CN¥1,300 (~US$185), Shipping will start on the first day of November. Other markets will probably get this handset in the coming months as well, but there is no information about this yet.